This bone marrow film at 400X magnification demonstrates a complete absence of hemopoietic cells. Most of the identifiable cells are lymphocytes or plasma cells. Photographed by U. Woermann, MD, Division of Instructional Media, Institute for Medical Education, University of Bern, Switzerland (http://www.aum.iawf.unibe.ch/). Fanconi anemia is inherited in either an autosomal recessive or X-linked fashion. Twelve Fanconi anemia (FANC) genes have been identified. These genes collaborate in a complicated pathway (FA pathway) that is responsible for the repair of DNA damage. One of these genes (FANCD1) is the breast/ovarian susceptibility gene (BRCA2). Shwachman-Diamond syndrome is an autosomal recessive disorder in which the majority of patients have a mutation in the Shwachman Bodian Diamond syndrome gene (SBDS), located at band 7q11. Amegakaryocytic thrombocytopenia is an autosomal recessive disorder with biallelic mutations in the thrombopoietin receptor, MPL, at the band 1p34 location. Diamond-Blackfan anemia is an autosomal dominant disease in which 25% of patients were found to have a mutation in the gene for small ribosomal protein (RPS19), located at band 19q13.2. In half of the patients, severe congenital neutropenia is associated with dominant mutations in neutrophil elastase (ELA2, located at band 19p13.3), while a few patients have mutations in GFI-1. Thrombocytopenia absent radii syndrome is associated with bone marrow failure, but no genetic defect for bone marrow failure has been identified in this autosomal recessive disorder. Pure red cell aplasia may be a secondary disorder caused by a thymoma. It may also occur transiently, resulting from a viral infection, as with parvovirus B19. Pure red cell aplasia also may be permanent, as a result of viral hepatitis. Finally, it may arise from lymphoproliferative diseases (eg, lymphomas, chronic lymphocytic leukemia) or collagen vascular diseases (eg, systemic lupus erythematosus, refractory anemia), or it may occur during pregnancy. Amegakaryocytic thrombocytopenic purpura has been reported to occur as a result of causes similar to those for pure red cell aplasia. Early forms of myelodysplastic syndrome initially can manifest as a single cytopenia or, more often, as a bicytopenia. A decrease in all three cell lines is the most common manifestation of bone marrow failure. Aplastic or hypoplastic anemia can be idiopathic in nature, or it can develop from secondary causes. Myelodysplastic anemia also can cause pancytopenia. Myelophthisic anemia may result from marrow destruction because of tumor invasion or granulomas. The prevalence of bone marrow failure resulting from hypoplastic or aplastic anemia is low in the United States and Europe (2-6 cases per million persons) compared with the prevalence of bone marrow failure resulting from acute myelogenous leukemia and multiple myeloma (27-35 cases per million persons). The frequency of myelodysplasia, on the other hand, has increased from 143 cases reported in 1973 to about 15,000 cases annually in United States. This is an underestimation of the actual prevalence, which is believed to be about 35,000-55,000 new cases a year. In Japan and the Far East, the frequency of bone marrow failure is at least 3 times higher than it is in the United States and Europe. Mexico and Latin America also have high occurrence rates, which are attributed to the liberal use of chloramphenicol. Environmental factors and the pervasive use of insecticides have been implicated as causes of this disease. The incidence of myelodysplasia has been estimated to be around 4-5 per 100,000 population per year in Germany and Sweden. The prognosis of bone marrow failure depends on the duration of the marrow function abnormality. Most inherited forms of bone marrow failure, such as Fanconi anemia, are associated with transformation into leukemia several years later. Viral causes, such as parvoviruses, are usually self-limiting. Acquired idiopathic aplastic anemia is usually permanent and life threatening. Half of the patients die during the first 6 months. Bone marrow failure resulting in failure to produce one, two, or all three blood cell lines increases patient morbidity and mortality. Morbidity and mortality from pancytopenia are caused by low levels of mature blood cells. Severe anemia can cause high-output cardiac failure and fatigue. Neutropenia can predispose individuals to bacterial and fungal infections. Thrombocytopenia can cause spontaneous bleeding and hemorrhage. The severity and extent of cytopenia determine prognosis. Severe pancytopenia is a medical emergency, requiring rapid institution of definitive therapy (ie, early determination of supportive care and bone marrow transplant candidates). Over time, the transfusion of packed red cells increases the patient’s total iron load. Increased levels of iron are toxic to various organs, including the heart, and iron toxicity can cause arrhythmia by blocking the bundle of His, diabetes by damaging the islets of Langerhans in the pancreas, and liver cirrhosis. (Iron can also produce bronze coloration in fair-skinned individuals.) Therefore, it is necessary to measure a patient’s iron stores (in the form of ferritin). Administering a chelating agent is an effective method of removing excess iron. Chelating agents are composed of molecules that bind tightly with free iron and remove the iron by carrying it as the agents are excreted from the body. Desferrioxamine is the iron chelator available in parenteral form. If given intravenously, its activity is short and it is excreted rapidly by the kidneys. A subcutaneous infusion given continuously by a portable pump for 3-4 hours every 12 hours is the preferred method. It optimizes the binding of the chelator to the free iron. As more free iron is excreted, storage iron is mobilized into the free form. This treatment can be performed in an outpatient setting. Monitoring serum ferritin levels and measuring total iron urinary excretion can determine the effectiveness of therapy. Most tissue damage can be reversed with timely chelation, except for cirrhosis of the liver (once it has set in). Young NS. Acquired bone marrow failure. Handin RI, Stossel TP, Lux SE, eds. Blood: Principles and Practice of Hematology. Philadelphia, Pa: JB Lippincott; 1995. 293-365. Richardson C, Yan S, Vestal CG. Oxidative stress, bone marrow failure, and genome instability in hematopoietic stem cells. Int J Mol Sci. 2015 Jan 22. 16 (2):2366-85. [Medline]. Chung NG, Kim M. Current insights into inherited bone marrow failure syndromes. Korean J Pediatr. 2014 Aug. 57 (8):337-44. [Medline]. Townsley DM, Dumitriu B, Young NS. Bone marrow failure and the telomeropathies. Blood. 2014 Oct 30. 124 (18):2775-83. [Medline]. Alter BP. Bone marrow failure: a child is not just a small adult (but an adult can have a childhood disease). Hematology Am Soc Hematol Educ Program. 2005. 96-103. [Medline]. Townsley DM, Desmond R, Dunbar CE, Young NS. Pathophysiology and management of thrombocytopenia in bone marrow failure: possible clinical applications of TPO receptor agonists in aplastic anemia and myelodysplastic syndromes. Int J Hematol. 2013 Jul. 98(1):48-55. [Medline]. Grewal SS, Kahn JP, MacMillan ML, Ramsay NK, Wagner JE. Successful hematopoietic stem cell transplantation for Fanconi anemia from an unaffected HLA-genotype-identical sibling selected using preimplantation genetic diagnosis. Blood. 2004 Feb 1. 103(3):1147-51. [Medline]. Molldrem JJ, Leifer E, Bahceci E, Saunthararajah Y, Rivera M, Dunbar C, et al. 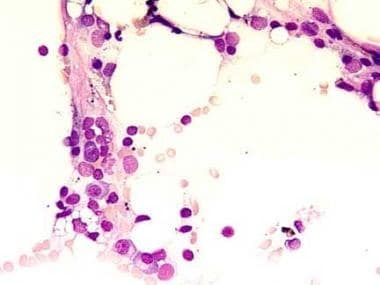 Antithymocyte globulin for treatment of the bone marrow failure associated with myelodysplastic syndromes. Ann Intern Med. 2002 Aug 6. 137(3):156-63. [Medline]. Parikh S, Bessler M. Recent insights into inherited bone marrow failure syndromes. Curr Opin Pediatr. 2012 Feb. 24(1):23-32. [Medline].